The Rural Industries R&D Corporation (RIRDC) invests in research, development and extension that is adopted and assists rural industries to be productive, profitable and sustainable. • Enhance sustainability across the rural sector. Through successfully implementing these goals, RIRDC will achieve an increase in knowledge that fosters sustainable, productive and profitable new and existing rural industries and furthers understanding of national rural issues through research and development in government-industry partnership. RIRDC’s core business is to maintain and enhance the productivity of the rural industries it supports and to address national rural issues through government-industry partnership. RIRDC’s funding comes from voluntary contributions and levy-payers in industry and funding from the Australian Federal Government. There is no statutory levy on wildflowers. Funding is provided by RIRDC core funds and industry voluntary contributions. For the period 2015 to 2018 RIRDC core funding will be on a competitive basis across the New and Emerging Plant Industries program. Preference will be given to projects that include matching funds from industry and align with the objectives outlined in the New and Emerging Plant Industries Three-Year RD&E Plan (2015–2018). To make it even easier to locate this information and know what wildflower research and development projects have been completed (and what the findings were), go to wildflower-r-d-information/completed-r-d-project-summaries-and-links for snapshots of wildflower R&D projects completed since 2000. You will find details of these projects presented in various tables, along with links to the final report or publication. 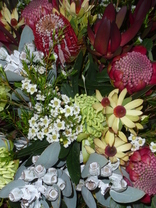 Around 1989, the Australian Special Rural Research Council was determining priorities for the funding of research and development for Australian native cut flower growing and exporting. Views were divided as to whether to develop a diverse selection of native flora or to concentrate on major crop groups such as waxflower, kangaroo paw, Proteaceae and Verticordia. The Rural Industries Research and Development Corporation took over from the Australian Special Rural Research Council and established its Wildflowers and Native Plants Program in 1990. At this early stage, five-year plans, in consultation with the industries and research community in all states, had yet to be developed. The initial objective of the RIRDC program was to improve the profitability, productivity and sustainability of the wildflower and native plant industry. During the life of the 1995-2000 plan, a total of $7.8M was invested in the program and much of the industry contribution was in kind rather than as cash. The 1995-2000 plan supported 55 projects. The 2000-2005 plan (which continued to support projects into 2006) invested $7.4M in wildflowers and native plants R&D. A comparison of the Five Year Plans 1995-2000 and 2000-2005 (excluding a commissioned project initiated in 2006), revealed that investment by the industry has increased from 12.9% ($1M) to 20.5% ($1.52M) of the total. During 2005 to 2012, final reports for 9 projects were finalised. Nine new projects were completed and eleven were underway in late 2011 (two of which are projects following on from earlier work). Investment in new wildflower projects is not expected beyond 2017. So, it shares a number of aims with the WildFlowers Australia Ltd and the wider Australian wildflower industry.